Simone Biles became the first female gymnast to win 10 world titles with two more World Championships golds. The 18-year-old American triumphed on beam and floor on Sunday's final day of competition in Glasgow. Elsewhere, Kohei Uchimura of Japan won his third gold of the week with first place in high bar. Great Britain's Nile Wilson was seventh in the parallel bars final, while Ellie Downie and Claudia Fragapane were sixth and seventh respectively on the floor. It meant the squad failed to add to their best ever tally of five world medals, but Wilson, 19, made history just by qualifying for the final as the first British man to do so. Great Britain leave Glasgow with one world gold, three silvers and a bronze medal - putting them fifth in the medal table. However, in making both men and women's team finals, Britain also secured their qualification for the Olympic Games in Rio next year. With a winning score of 15.800, Biles overtakes Russia's Svetlana Khorkina, Romania's Gina Gogean and Larisa Latynina of the Soviet Union - who all won nine world gold medals - to become the most titled female gymnast in history. Biles also won team gold with the USA, a record third successive individual all-around title, and a bronze medal in the vault. Fragapane, 18, was back at the scene of her floor title at last summer's Commonwealth Games, but Downie, 16, just pipped her team-mate. 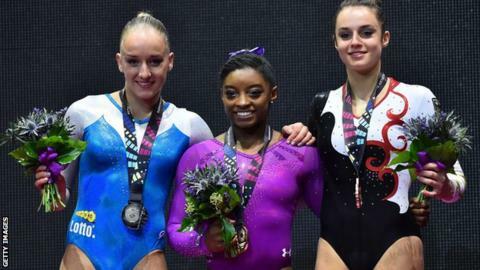 Both women were part of Britain's first world team final medal - claiming bronze earlier in the championships. On Saturday, Max Whitlock followed up his floor silver by winning the first world gold by a British man on the pommel horse, with compatriot Louis Smith taking silver. That followed the men's silver in their team competition.